Introduction. Abbreviations. Chapter headings: 1. Energy conversion in higher plants and algae (G. Forti). Photosynthetic bacteria (B.K. Pierson and J.M. Olson). 3. The bacterial reaction center (W.W. Parson). 4. The primary reactions of photosystems I and II of algae and higher plants (P. Mathis and A.W. Rutherford). 5. Electron paramagnetic resonance in photosynthesis (A.J. Hoff). 6. The photosynthetic oxygen-evolving process (G.T. Babcock). 7. Photophosphorylation in chloroplasts (M. Avron). 8. Carbon dioxide assimilation (F.D. Macdonald and B.B. Buchanan). 9. Substrate oxidation and NAD+ reduction by phototrophic bacteria (D.B. Knaff and C. Kämpf). 10. Structure and function of protein complexes in the photosynthetic membrane (N. Nelson). 11. Structure and function of light-harvesting pigment-protein complexes (H. Zuber, R. Brunisholz and W. Sidler). 12. Molecular organization of thylakoid membranes (J.M. Anderson). 13. Structure and exciton effects in photosynthesis (R.M. Pearlstein). 14. Genetics and synthesis of chloroplast membrane proteins (J.C. Gray). 15. Evolution of photosynthesis (H.J. van Gorkom). Subject index. Photosynthesis is an active area of research in which many exciting developments have taken place in the last few years. This book gives an overview of the present understanding of all areas of molecular processes of photosynthesis. It is based on the international literature available in the summer of 1986 and much unpublished material. The new material contained in this book, together with a basic framework of established concepts, provide a useful source of reference on the biochemical and biophysical aspects of photosynthesis in plants and bacteria. 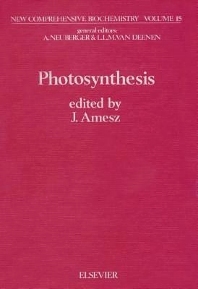 The book is written by specialists in the various areas of photosynthesis and is useful both for workers in these areas as a source of specialized information as well as for non-photosynthesists who want to become informed about recent developments and basic concepts in this area.